We have seen the welding of metals which is a very common process and is used in all places for fabrication of Mild steel Stainless steel and other metals. Though this is a critical process involving electrical energy the risks are far lesser when compared to underwater welding. All types of energy, when used with precaution, is a marvelous science and might be life taking if used carelessly. 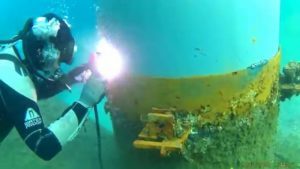 This principle becomes even more while carrying out underwater welding. Since this is a very difficult skill to learn and might be life taking, there are few who can successfully become a certified underwater welder. The underwater welding death rate should be a guiding principle to know the responsibility attached to the trade. As a result, the underwater welding pay packages for such are also very high. With the advent of newer technologies and flawless safety standards, underwater welding has become a lucrative job opportunity for aspirants. Before we know about how the welding is done underwater we must first try to understand what is underwater welding. Welding inside water or in contact with some fluid is such a bad match. We have always known that welding is to be carried out away from water. If anyone asks what is underwater welding you may straight away answer that it is a Shocking Science. Water is thought to be a threat to the use of electricity. As the name suggests the welding work carried out underwater is called underwater welding. It is similar to normal welding but is carried out under water. 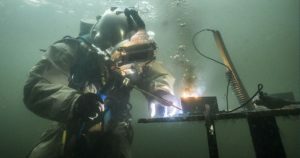 Only the equipment is modified to suit the aquatic environment and the welder remains submerged in water while welding. This can be carried out by two methods – Wet welding and Dry/Hyperbaric welding. Now as we know what is underwater welding we need to see how it works. This type of welding is necessarily under pressure welding, that is, under a pressure greater than the atmospheric pressure. In Wet welding the welder and the welding torch are in direct contact with the water and the welding is carried out by being submerged in water. Wet underwater welding directly exposes the diver and electrode to the surrounding water and surrounding elements. Divers usually use around 300–400 Amps of direct current to power the electrode. Varied forms of arc welding are used. This is a comparatively cheaper method but more hazardous. In this method, the cathode is the welding torch and the anode is the welding surface. Waterproof electrodes are used. In this case, a plasma is forced through the heavily insulated cathode. Gas like oxygen is thrown out of the cathode through the flux it creates a gaseous environment around the welding spot through innumerable tiny bubbles which separate the electric arc from the surrounding water. These bubbles separate the welding surface from the surrounding water also. Around 67% of the heat goes to the welding surface and the balance 33% moves back to the anode through the return path. As the welding progress, a slag is deposited uniformly on the welded portion isolating the weld from the surrounding water. In the forward and return path of the current, a knife switch is used. The circuit is closed when the switch is closed at the time of welding. When the torch is not in use like while changing the electrode the switch is opened to disconnect the flow of current. The negatively charged electrodes flow from the cathode to the welding surface whereas the positively charged electron passes from the welding surface to the cathode. Here the source of the power supply has a negative polarity and necessarily a Direct Current (DC) supply. When the current flow is required the welder instructs the above water crew to close the switch and again signals to cut the circuit when not in use by signals. Another difficulty in this type of welding is the bubbles generated that moves upward continuously and making it difficult for the welder to see the surface. After tedious training, practice and experience the welder learns to weld in such condition. Last but not the least you should also know the dark part of the trade. That is the underwater wielding death rate. Like any other trade, the underwater welding comes with many profession oriented hazard. So before you jump onto the profession you should know the bitter part of the trade also. Once you research on the danger of the trade like underwater death rate you will also learn to avoid any such happening. For any diver, there are risks of decompression sickness, hypothermia. Downing in the event of equipment failure is all possibilities. Welders are posed to the danger of electric shock. Working on certain structures introduces the risk of an underwater explosion too. The welders are reported to have hearing problems after prolonged working along with muscle ache, memory issues and cognitive ability. A high level of safety is required for this profession. The safety is two-pronged. One is the safety precautions for diving which is a separate trade. The other is the welding underwater where a separate set of safety norms are to be adapted. 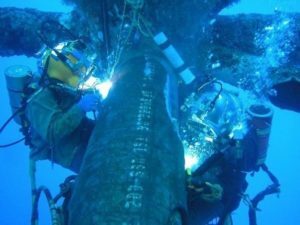 Due to the high hazard connected to the trade, the safety statistics are denoted by an underwater welding death rate. Out of 3000 full-time welders, 5 lose their lives annually. This translates into about 50 deaths out of 1000 in the life term of a welder. This is pretty high. As per OSHAS, the death rate will go down as new safety protocols are being developed and use of advanced technologies. Drowning has been found to be the number one cause of death. As per older records and present statistics around 11 underwater welders die every year. This data is not to deter the aspirants from the lucrative trade but only to caution them with the safety responsibility involved in this profession. A high level of precision and flawless practical knowledge are the demands of the profession along with physical fitness. A small mistake may kill yourself or your colleges. Apart from the above the underwater welding death rate also depends upon the type of equipment provided by the employers to the welders. Also, the quality of training and supervision is a key factor in ensuring the life and safety of the welders. It is unfortunate when it is identified the fatality is caused due to a small mistake on the part of the welder himself. The person who has met with such an underwater accident should try to approach the authorities for proper compensation. Employers say that it is becoming more and more difficult to find skilled blue collared workers. Since most of the aspirants are going for university degrees and opting for white collared jobs. But the fact is the blue collared jobs are viable and also very highly paid. Underwater welding pay is all the more lucrative. In the case of underwater welding, it is a very skilled job and is not meant for everyone. Hence, it is evident whoever gets certified in this trade and successfully completes the practical certification they are in high demand in the offshore industry and oil and gas fields. As high as $ 1,50,000 was underwater welding salary offered to an underwater welder for pipeline job since such skilled worker was so rare at the time.